Capital Marketing Services (CMS) is an independent logistics service provider that began its operations in 1998. Initially conceived as a distribution company, over the years it has progressed and is now involved in providing transportation and warehousing services to its clients. 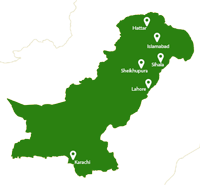 CMS manages an extensive transportation network, covering haulage in nearly every major city and town of Punjab, Sindh and KPK. The type of transportation service varies depending upon the source and destination of the haulage and is categorized into primary and secondary transportation. Primary transportation entails providing freight transportation service from the manufacturer’s warehouse or manufacturing unit to its secondary warehouses or depots. Secondary transportation encompasses transporting freight from secondary warehouses to various distributors or dealers. CMS provides both primary and secondary transportation services to its clients. To cover the vast network, CMS has deployed new & modern trucking fleet of over 250 trucks, ranging from 6-wheeler trucks with a carrying capacity of 10 tons to 22-wheeler trucks with a carrying capacity 70 tons. The diversity of the CMS’ fleet enables it to provide fast, efficient and reliable delivery solutions to customers. CMS also provides its clients with warehousing services. The warehouses are located in Islamabad and KPK and have a combined area of over 100,000 square feet.